“Dusty Miller, with its elegant soft silver leaves, makes a charming companion plant that contrasts nicely with vibrant pink and purple petunias and other bright colored annuals in both beds and containers. Pair it with light pinks, gentle mauves and other pastels for a look of quiet elegance. 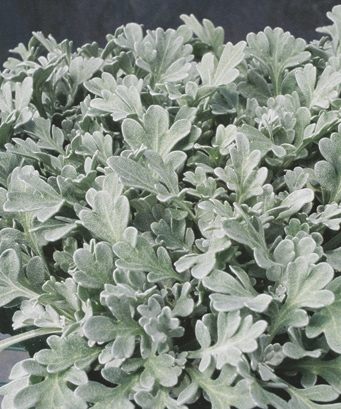 When cut for use in fresh or dried floral arrangements, dusty miller makes a great filler that adds a lacy texture”. Written by Nancy Szerlag in her Annuals For Michigan by Lone Pine Press.